Most dogs love the water. How can you encourage this natural affinity, with safety and enjoyment? In the following excerpt from Clicker Gundog by Helen Phillips you'll explore the important skill of swimming—valuable for all dogs, whether or not they are trained to hunt. You'll also discover how to train your wet dog to shake on cue—which means no more undesired showers from your wet and muddy friend, fresh from the pond! 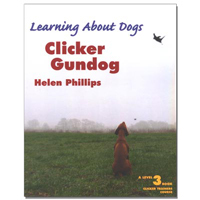 This comprehensive book, which Karen Pryor calls the "essential guide to clicker training the gun dog," is now available from KPCT. While this article is written with hunting dogs in mind, the excellent principles apply to most any canine companion. Enjoy! The majority of gundogs are natural swimmers and love nothing better than doing it for pure pleasure. There is a skill to it, and experience alongside confidence is also required. Some dogs find the paddling action difficult to master at first, causing them to lift out the water at the front end whilst the rear end sinks—lots of splashing but no movement. This is one of those skills where practice does make perfect. Introduce a puppy or young dog to water as early as possible. I give my puppies bowls to play and splash about in from around 6 weeks on. The last litter of puppies found the new pond in the garden and introduced themselves to swimming at a very early age whilst watching the older dogs splash around and chase each other. Begin by finding a pond or lake with still or very slow moving water. I would not recommend using the river for the first lessons, as the currents can be very strong. The water may be still on the surface but moving at great speed underneath. Watch out for the blue-green algae that appears early in the year; this can be very harmful and sometimes causes death (it is toxic to us as well). Find somewhere that the dog can enter and exit the water easily via a gentle slope. Be prepared to enter the water with your dog. This may be all they need to build the confidence to take the first step. Taking a favorite toy may also be helpful if they are reluctant. If your dog is a little hesitant, spend time playing in the shallows and gradually let them make their own choice to enter further. Click for the decisions and reward with chase for a toy or food if appropriate. If your dog is a little hesitant, spend time playing with them in the shallows and gradually let them make their own choice to enter further. Click for the decisions and reward with chase for a toy or food if appropriate. The dog will need to keep their body flat on the surface of the water and develop a paddling action with their feet. If your dog is having difficulty, then help them by supporting under their belly, slightly raising the back end until they are flat. Click for this position, and gradually reduce your involvement. Reward with a chase of a toy to the shore, or being allowed to leave the water. Take your time and do not rush this. 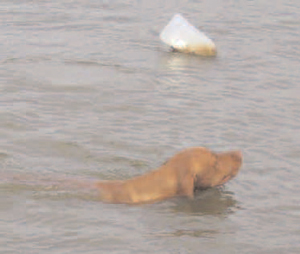 My first Vizsla fell in the river as a young dog. The shock of this was so great she never entered water again. She walked around puddles, in case they were deeper than they appeared; the trauma can have a lasting effect. Make sure your dog is confident in entering the water before introducing the retrieve. Using the retrieve to teach the swimming may work with some dogs, but the shock of entering the water may develop avoidance of both the retrieve and swimming in others. Once established and your dog is confident, attach your swimming cue. This will be used to cue your dog to enter the water when building the chain with retrieve. When leaving the water the dog will naturally wish to shake. This is normally no problem unless they are carrying game. The enthusiasm and force that is put into shaking results in the game having the appearance of a rag doll. It can also encourage the dog to grip tighter than normal so as not to let go, or the force throws the game from the dog's mouth. Capture the behavior and attach a cue. Set up the situation where the dog can leave the water easily and you can be in close proximity. As soon as the dog shakes, click, reward appropriately. This can be with verbal encouragement from you, continued shaking, or food if your dog will accept this, or even back for more swimming. Set up scenarios at home, douse your dog with the hosepipe and capture the shake from this. Dogs will shake even if a small amount of water is on the top of their head; they do not need the full body shower. Anticipate when the dog is going to begin the behavior and attach a verbal cue to it. Build on this until the behavior only happens when cued. This can then be introduced when your dog is retrieving from water. The dog will deliver the retrieve to you on leaving the water and wait to be cued to shake. Submitted by aftergadget on Sat, 2011/08/06 - 1:40pm. I've always found KPCT articles so helpful, but this one didn't answer my question. Maybe because this is an excerpt from a book, a lot of information is condensed, resulting in an article that seems to have a lot of "lumping"? All but one of my previous dogs (she refused to even put a toe in the water), including my current SDiT, like to wade into the water up to their armpits, but tend to act panicky when their feet don't touch the bottom anymore and they have to actually swim. Then they turn around and swim back to where they can stand. With my last dog, we used retrieving a floating squeaky ball along with click/treat to get him to swim, just to retrieve the ball. However, my current SDiT only wants to wade across streams (which are not accessible to me to get to), not even wade into the pond area where swimming would be possible. Starting from the assumption of a dog whose belly is in the water and who will let you do something like put your hand under their belly assumes a level of ease and enjoyment in the water that a lot of dogs don't have. Also, I am unable to go in the water myself. Some tips on ways to shape a dog to swim from land would be most welcome. I'm imagining many short sessions of clicking for putting in a toe then deeper and finally for paws off the bottom? Submitted by smart dog university on Sat, 2011/08/20 - 7:47pm. Have exceptionally delicious, pea-sized treats. Salmon, chicken, steak, lunch meat, etc. Get as close to the water as safely possible. Split the behavior into tiny pieces, clicking and tossing the treat toward the water until your dog is finally IN the water. You may want to break this task into several short training sessions. You know your dog, and you'll be able to tell when she needs to quit. It would be helpful if the treats float (!) because once the dog is knee-deep in the water, it will be easier for you (and the dog) if you can toss the treats (after you click) out into the water (so the dog doesn't have to trek back to you and then back to the water every time you click). As you approach what I call the "speed bump," -- the place where your dog is starting to wonder if this whole thing is a good idea -- you'll begin to split your criteria into even smaller pieces. At this point, I'd be clicking simple muscle movements, not actual steps, that would lead her even a fraction of an inch into deeper water. Good luck and have fun -- this is a terrific clicker training (and shaping!) project! Submitted by flaren on Mon, 2008/08/11 - 1:39pm. Great article. Our new lab pup seems to be terrified of the water. We went to a very calm inlet beach, and got him to the edge and in about up to his chest (of his own free will), but then he all of a sudden ran like all heck back up the sand to the blanket and tried to climb inside the sweatshirt I'd brought along! Maybe he was afraid of the waves? Now that I'm a bit more knowledgeable about clicker training, and especially with the help of this article, I can hopefully start coaxing him back into the water again.